Badger is a telecommunications company in Grand Theft Auto IV, Grand Theft Auto: Chinatown Wars, and Grand Theft Auto V.
It is Niko Bellic's first mobile phone provider that he uses to communicate and interact with the environment. Badger equipment is not compatible with ring tones or wallpaper and only prominently displays the Badger logo as its theme. Even though Roman supposedly gives his old phone to Niko during the mission It's Your Call, the player can still access the phone beforehand, though the only thing that can be done with it is trigger multiplayer and, in the PC version, the Video Editor. The PDA present on the touch screen runs on the Badger network. The software is apparently known as BadgerOS, and gives the player access to the game's menus and features. 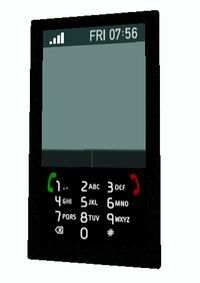 While mobile phone conversations are not present, the PDA (as well as the computer found in safehouses) can be used to receive email. On the PSP version of the game, there are three themes selectable from the Settings menu (which can be found inside the System application), the default is Badger's skin, but one for "Sprunk" and another for "Tw@ Internet Cafe" can also be chosen. Badger is listed on the BAWSAQ exchange and the company's operations in the state of San Andreas are based out of the Badger Building in Vinewood. The Badger network, like the Whiz network, is capable of sending photos, as shown by Ray Boccino sending you a picture of a target in the mission A Long Way to Fall, which means that perhaps Niko's inability to use themes, ring tones and to take and send pictures is due not to the network but to the cell phone he used at the time. Strangely, Ray Boccino's phone is a Badger phone, but the screen shows that it has a Whiz Wireless theme. However, the same model is used for Roman's phone, so it may be a generic model. This page was last modified on 12 May 2014, at 19:58.